Bhutan is a magical, hidden Himalayan kingdom. 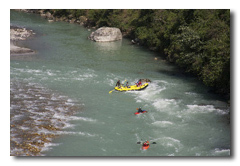 Here you will see gigantic mountains, lush forests, picturesque valleys and pristine rivers. You will enter the charm of an ancient world and meet a people who value their heritage and are preserving it with integrity. Prayer flags, prayers wheels, stupas and the unique architecture of Bhutanese homes dot the landscape. Adding even more texture to this landscape - each region hosts an ancient monastic and administrative fortress, known locally as a “dzong”. 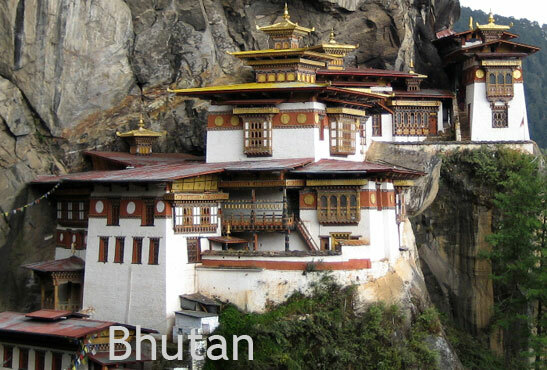 Bhutan values its spiritual heritage of Vajrayana Buddhism, (a form of Buddhism rich in ritualsm art and and it is the only country in the world that boasts this as the national religion. Its influence pervades every corner. Tourists and locals alike love the annual masked lama dancing which take place on festival dates in remarkable courtyards with monastic backdrops. Bhutan opened its doors to the outside world in 1974 and they warmly welcome all visitors who will respect the delicate balance of this pristine natural enviornment and the sacred values of its people. Most international guests enter Bhutan on a spectacular flight over the Himalayas. Upon reaching Paro you will know you are in a pristine land, different than any other. The beautiful valley with lush crops of rice and chilli, the unique architecture and the simple and homey main street - you know you are in for a special treat. 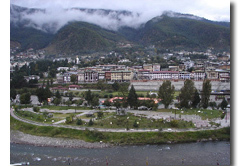 If you have only three days, Paro and Thimphu is where you will stay. Thimphu is the administrative centre and houses a wonderful Folk Museum, a School of Traditional Arts and an Institute of Traditional Medicine that will give you an overview of Bhutanese life. After that the choice is yours to visit archery games, dzongs (Tashichho or Semtokha), the National Memorial Stupa or simply wander down the main streets or walk in the surrounding hills for a magnificent view ( try Sangaygang radio tower, Jigme Dorji National Park, or the three walk to Phajoding Monastery). Also visit Cheri Tango Monastery - 15 km drive out of Thimphu and a magnificent one hour hike. Paro is a small town with very traditional town architecture. It is situated in one of the most beautiful and fertile valleys that grow red rice. Archery, the weekend market, dzongs (Ta, Rinpung and Drukyul), Kila Nunnery, Druk Choeding temple and Kychu Lhakang are all worthy sites. Please don’t forget to visit Takstang Monastery or Tigers Nest. This is the icon of Bhutan. Precariously perched on the edge of a 1200 metre cliff this remote place became holy when Guru Rinpoche flew up there on the back of a tigress and meditated in a cave. Dochu-la pass must be crossed before reaching Punakha. Here a magnificent view of the Himalayas puts our human life into perspective. The 108 chortens that don the hilltop serve to remind us of life’s deeper meanings. Punakha Dzong (administrative and religious fortress) is fully restored and spectacular. It mightily stands on an island at the confluence of two rivers. On entering you cross over an ancient bridge and inside this many-layered complex are halls and temples that house holy relics, statues and murals. Outside Punakha a pleasant hike is to Chime Lhakang. Here learn about Bhutan’s crazy wisdom yogi Drukpa Kunley – you can even receive a special fertility blessing! It is a long windy road (as are all the roads in Bhutan) to Bumthang. However there are great sites on the way. Chendebji Chorten by the river, constructed to ward off evil spirits, now a happy picnic spot. Closer to your destination is the regal Trongsa dzong, which stretches along the ridge like a lion watching its cubs. Also in Trongsa is Ta dzong, with the only shrine dedicated to King Gaesar of Ling. 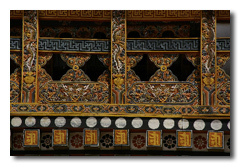 Bumthang is the spiritual heart of Bhutan, and is actually a region covering four valleys. The township is a sleepy mountain village and its main street looks like the American Wild-west with log huts and simple stores. 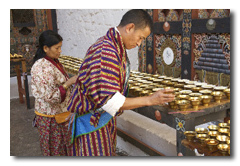 Kurjey Lhakhang (temple) comprises three temples and is surrounded by 108 chortens. The temple on the right was built in 1652 against the rock face where Guru Padmasambhava meditated in the 8th century. The middle temple is built on the site of a cave containing a rock with the imprint of the Guru’s body, and is therefore considered to be the most holy. The temple on the left was built in the 1990’s by H.M. Ashi Kesang, the Queen Mother. Jambey Lhakang (7th Century)is one of 108 temples, legend says, that was built in one night by King Songtan Gampo. 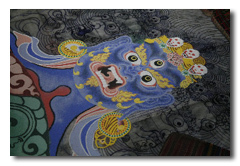 He did this to subdue a giant demoness who was trying to prevent the spread of Buddhism in Bhutan. This site pins the demon to the earth, preventing her from causing more trouble. Jambey Lhakhang is said to be holding down her left knee while Kyichu Lhakang in Paro pins down her left foot. Tamshing Lhakang - Located across the river from Kurje Lhakhang, this temple was founded in 1501 by Terton Pema Lingpa, a re-incarnation of Guru Padmasambhava. There are very old religious paintings around the inner walls of the temple, which was restored at the end of the 19th century. Jakar dzong – Constructed in 1549 by the great grandfather of the first Shabdrung, the dzong was initially built as a monastery. It was upgraded in 1646, after the Shabdrung had firmly established his power. Jakar Dzong is now used as the administrative centre for Bumthang valley, and also houses the regional monk body. The town is famous for its honey, cheese, apples and apricots. Mema Tso is where a scriptural treasure of Guru Rinpoche was found at the bottom of the river. There are also sites of Longchenpa and Pema Lingpa who each visited this beautiful area. Hike the hills and valleys of this beautiful area and at night rest by the fireside over a glass of wine or hot chocolate. Beyond Bumthang is lies a magnificent and less travelled part of Bhutan. There are far less valleys and even the villages are perched high on the slopes. 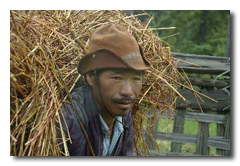 The scenery is dramatic and the native Sharchopas are the biggest ethnic group of Bhutan. Less affected by modernisation this area has many wonderful features – traditional lifestyle, magnificent dzongs, deep forests, mountain ridges that cascade into the distance, unique weaving and as always in Bhutan as much chilli in every dish that you can handle! Townships are Lhuentse ( famous for weaving), Mongar ( town and dzong), Trashigang (town and dzong), Trashiyangtse ( Chorten Kora, Bomdeling for Black-necked cranes and Gom Kora temple) and Samdrup Jongkhar. You can fly to Delhi or Calcutta from the Indian town of Guwahati ( capital of Assam), via Samdrup Jongkhar. 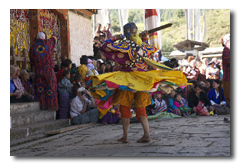 Known as cham these are performed by lamas and sometimes lay people as part of their religious festivals and practices. Annually these take place in the courtyards of the monasteries on the Tibetan tenth of the month, which is known as teschu. The dances are said to bring blessings to those who watch and are part of a spiritual practice for those who perform. The dances have specific meaning – they may purify the mind, instruct in the Buddhist teachings, or tell a story - the most famous stories you could see is of Guru Rinpoche. The dancers are masked as deities, animals, clowns and demons. Colourful and meaningful these festivals days give a real insight into the life of Bhutan. Many tours are organised around these dances. 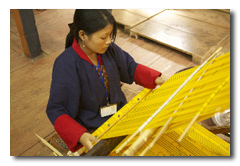 The thirteen traditional arts and crafts of Bhutan are weaving, sculpture, woodwork, carving, masonry, painting, leatherwork, stonework, blacksmithy, silver/goldsmithy, bamboo work, paper making, and tailoring/embroidery. Some of the best trekking in the world, with breathtaking scenery, a rich Buddhist culture, friendly people, and few other visitors. You may add to your itinerary a short trek while in Bumthang or a day hike while in Thimphu. There are lovely treks from Paro to Thimphu. One will take 5 days hiking the other 8 days, past the beautiful Tshophu (lake), Chomolhari and Jichu Drakey (mountains). Unlike Nepal and Ladakh for serious high altitude trekkers, the season is short and limited to April and October. The most famous and difficult one is the Snowman Trek – few people can actually complete this one! With 70% forest cover, a moist climate, low population density and a strict conservation policy, Bhutan is rich in birdlife - over 770 species. Perhaps the most famous event is to watch the Black-necked cranes, which arrive from Tibet in the winter, to feed on a special type of bamboo that is found on the wetlands of Phobjikha Valley (near Gantey). Spring or autumn, are the best seasons to visit – i.e. February to April and September to November. Other months are good especially for the east of Bhutan where it is much warmer. Indian Nationals do not require a visa to enter. Citizens of all other countries do and this is based on a preapproved itinerary. No foreign missions/embassies abroad grant Bhutan tourist visas.